At 5 and 7 o'clock the multi-directional properties of 4D braided cloth help stabilise the torsional twist at key points of the racket. At 3 and 9 o'clock one layer of 4D braided cloth provides the torsional stability previously only achievable with several layers of carbon fibre. As a result of only one layer being used insted of several this softer material also provides superb touch and feel at ball contact. The Dunlop Aerogel 4D Pro is a pro player specification frame that features an even balance to generate greater momentum during swing cycle, thereby enhancing power. Reactive energy generated is delivered using 4D Braided tecnhnology to maintain control. 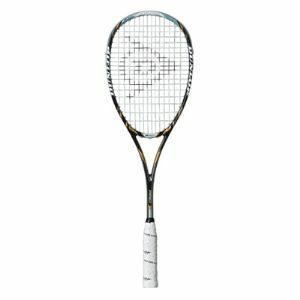 A superbly constructed squash racket to drive the Dunlop Pro frame legacy forward.